You will find these brochures in your Campaign Package and these can be handed out to each of the businesses you approach. They can act as a great conversation starter. They contain information about what we do/how funds are used and provide the SBIA website address for additional information. Clearly write your contact information on the back of each brochure. 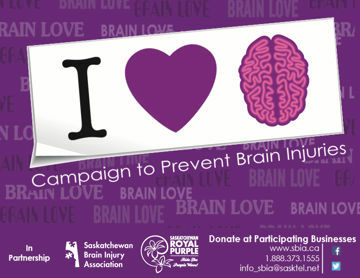 This brochure is to be handed to each of the businesses that agree to partner with the BrainLove Campaign. The brochure will provide BrainLove instructions for the business, important dates, as well as contact information and websites for more information. Clearly write your name on the back of each card, so the business know who to contact if they have questions or run out of stickers. Some businesses may choose to collect cash donations rather than set up an account through the till to collect donations. Please give this envelope to businesses who choose to collect cash donations. On April 1, you will return to all businesses you contacted and provide them with the Acknowledgement of Donation Pick-Up Form. Please provide them with a copy, keep one for your Lodge, and the original should be included in your package back to SBIA. When you pick up the donation, be sure to pick up any remaining BrainLove Stickers, and the Business Instruction Card.